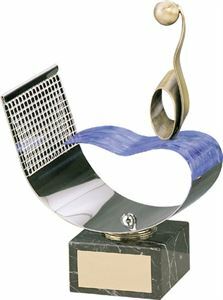 This cleverly designed award has been handmade from a single piece of curved, polished metal to create both a goal and the wavy surface of water. The goal has been decorated with net detailing while the water has been hand painted with blue. A gold metal water polo player is positioned on the surface of the water, preparing to score a goal. This striking Water Polo Wave Handmade Metal Trophy is sure to be a talking point at your prize giving ceremony. The elegant design of the Water Polo Wave Handmade Metal Trophy makes for a unique award. Handmade in Spain by skilled artisans, the trophy has been crafted from quality metal and features a water polo player preparing to score a goal. The trophy is supplied in 3 sizes and is mounted on a marble plinth upon which can be applied an engraved text plate.